Caffeine and Exotics is more than just your typical car show. It is a gathering of the most luxurious and spectacular vehicles all in one place, drawing people from all over to see, in person, just how incredible these mechanical beasts really are. Caffeine and Exotics has quickly become a nationally recognized event dedicated to the passion and enthusiasm for exotic cars. There are typically over two hundred privately owned exotic cars on display, including Lamborghini, Ferrari, McLaren, Rolls-Royce, Aston Martin, Porsche, Lotus, Maserati, Bentley, Audi, GTR, Corvette, Viper, and much much more. Each show is an opportunity to showcase various pieces of our inventory, as well as an opportunity to meet and talk with other exotic car owners–fanatics like us, who share the same appreciation and excitement for these vehicles that we do. Every two months from April to October, we at Merlin Auto Group, gather at the store early on Sunday morning to pick up the super cars that were selected the week before to be our display at that week’s Caffeine and Exotics car show. 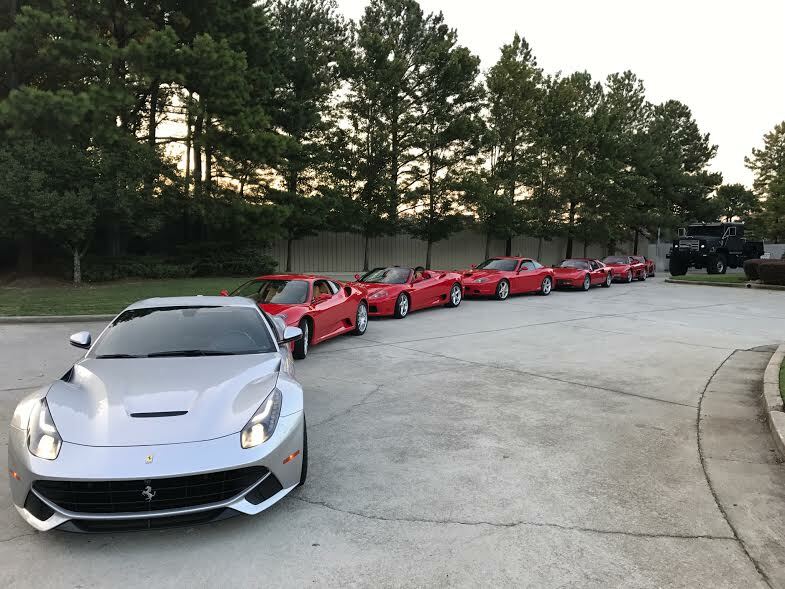 With over forty pre-owned Ferraris in our inventory, one might think we could randomly select five or six cars for every show and it would not matter, Ferrari-enthusiasts would be excited all the same…which may be true. However, our owner, Adam Merlin, carefully and strategically chooses which exotics go with us each time. “This show was all about classic and timeless cars,” Adam said, meaning various, iconic models from different years, and, of course, all “Ferrari-Red” (Rosso Corsa). So, this August, we brought our 2009 F430 Coupe, 2005 360 Spider, 1987 Testarossa, 1992 348, 575M Maranello, 1987 328. Finally, we brought our 2015 F12 Berlinetta, and while it is not Ferrari-Red, it is the most recent-year Ferrari model in inventory. Every Caffeine and Exotics experience is a fun and exciting one. We love being around other beautiful cars and their loving owners, and all those who understand the magnificence of these vehicles more than anyone. Come out Sunday, October 15th, to the next Caffeine and Exotics show and see what we bring!